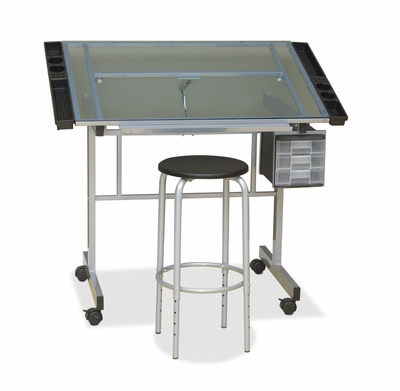 For artists with limited space the Studio Designs Vision 2 Pc Craft Center with Glass Top is a complete art studio contained in a large table with drawers and a comfortable artists stool. Beautifully designed the Studio Designs Vision 2 Pc Craft Center with Glass Top has tempered blue glass work surface with powder coated steel framing. The stool and matching artists work desk are superb examples of modern, simple, and functional design. The table has ample storage that any artist will welcome to aid in being organized. The top has an easy to use adjustment feature that allows up to a 70 - degree tilt. The tilted surface is a drafting table that works for the most discriminating designer.